Children in the Jerusalem community who now have access to clean drinking water. A Better World is pleased that Don and Phyllis Corkum have chosen to celebrate this milestone in their lives with a gift to help others. In Honour of their dedication and commitment to serving God and humanity A Better World will be implementing a water irrigation system and clean drinking water supply that will serve the Jerusalem Community of over 6,000 people in need of water. Our goal is to raise $10,000. We are grateful that the Corkums have chosen to sponsor this project to mark their 50th wedding anniversary. Since the Corkums initiated this project, many other donors have also started funding. Currently, Royal LePage is funding the 3rd phase of development. 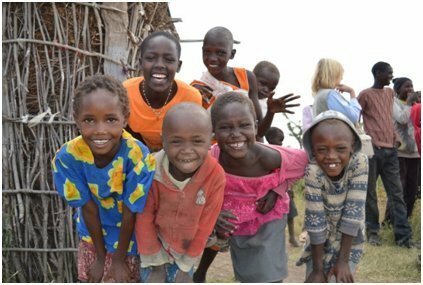 Our partner in Kenya is Segera Mission, an organization that promotes health, education, sanitation, and agricultural training to the local villages. Jerusalem is one of the surrounding villages. Segera Mission has taught Jerusalem to grow their own agricultural crops of maize, beans, and cabbage. The gardens were doing great until the rain stopped and they had no way to sustain their crops.